Am I the only American who wasn't out shopping this weekend? Probably not, but do wonder sometimes. I'm well aware that I am missing out on huge savings by avoiding the "Black Weekend" sales. On Friday, the New York Times was so thick with store circulars it looked like the Sunday Times. Every year I'm tempted to venture out to the stores, but then visions of crowds and chaos keep me at home, where I wait patiently for Cyber Monday. I love Cyber Monday. I love shopping and saving on holiday gifts, while enjoying the peace and solitude of my home. Over the weekend, I made up a list of gift ideas for my girlfriends, sisters, and sister-in-laws over 50. This afternoon, I did a little pre-Cyber Monday search of the items to see if they were on sale anywhere. I was pleased to find that many (though not all) of my gift ideas are either priced below $50 or are reduced to under $50 during Cyber Monday sales. For example, these perky red Valloire Dotty Gloves are $48. For my gift shopping list for the women over 50 in my life, scroll down. And for links to many of the Cyber Monday sales, visit On Sale. Faux fur everything is trending this season. For example, what could be cozier than a faux fur scarves wrapped around the neck? Prices for faux fur scarves range from $24 to over $100. Nordstrom has a nice selection of faux fur scarves. However, I have my eye on the styles that are reduced during the Nordstrom Flurry of Savings: Save up to 40%. FREE Shipping. FREE Returns. Take, for instance, this Women's Echo Faux Fur Infinity Scarf (was $68, now $34.17). Or how about Lord & Taylor Fur-Trimmed Leather Gloves (was $82, now $41)? And last, but not least...Here's a Banana Republic Faux Fur Clutch Size One Size - Natural ($98, before 40% off). If you're shopping today or tomorrow, click Banana Republic and save 40% on all purchases. I gave a Kate Spade iPhone accessories set to a girlfriend last year and it was a big hit. A girl can't have enough decorative phone covers, can she? Nordstrom has a huge selection of iPhone cases on sale right now, like this Women's Tory Burch 'Kyoto' iPhone 5/5s Case (was $50, now $33.50). You'll find phone cases by Marc by Marc Jacobs, Michael Kors, and others on sale and under $30. EVENING SHAWLS: SHALL WE DANCE? An evening shawl is the perfect accessory for the holiday season. I know my girlfriends and female family relations will appreciate receiving a twinkly wrap like this Collection 18 Sequin Lace Scarf ($48) to wear on New Years Eve. I would also like to find some three-quarter sleeve gloves for a girlfriend or two. They're just so Audrey Hepburn sophisticated, don't you think? Here's a pair of black ones at Talbots ($99 before the Cyber Monday discount). The gloves comes in six colors, including a gorgeous blue. And if you Shop Talbots Cyber Monday, 50% off 1 regular-priced item plus 40% off your entire purchase. And Free Shipping! I can't think of anything that expresses how much someone's friendship or family support means to you than a special gift from the Jo Malone collection. Jo Malone has added many scents and products to the collection, making it easy to find something for everyone on your list. In addition to the very popular fragrances, there are candles and bath and body products. This Jo Malone 'White Jasmine & Mint' Body & Hand Wash 8.5 oz ($40) sounds wonderful. The Kiehl collection also makes wonderful gifts. Do you know someone who isn't familiar with the Kiehl products? Perhaps, you could introduce her to the collection with the Kiehls Hydration Kit ($29). The kit, which includes four skin hydrating products, comes in a gift box for the holidays at Nordstrom. Click Find great gifts, including under $25, for all your holiday occasions at Nordstrom. FREE Shipping. FREE Returns. and search "Beauty and Fragrances" for this other gift ideas. Most of the women in my orbit love jewelry and seem to welcome a new bauble at the holidays. Of course, it's important to have a sense of your friend's or female relation's taste in jewelry. In December, holiday bazaars pop up around New York City and many of the vendors are jewelry designers. If you don't have holiday bazaars in your area, you might want to check out the nicely-priced clip-on earrings at Boyer New York. I wrote about the Flattering50 review jewelry collection and Lisa Harris, design director and brand enthusiast, back in August. 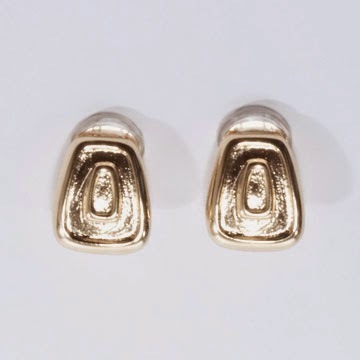 I like the simple Trapezoid Clip Earrings ($45) below. Through Dec.12th, Lisa is giving Flattering50 readers a 15% on all jewelry with code: Flattering50. Anthropologie also has a very extensive jewelry collection. Prices range from under $100 to well over $1000. I've been mad about hoops this fall, so these Jeweled Orbit Hoops ($48) caught my eye. Finally, I think it will be fun to add a copy of How to Tie a Scarf: 22 Styles ($10.55) to a few gift bags. Happy Cyber Monday and Holiday Shopping!